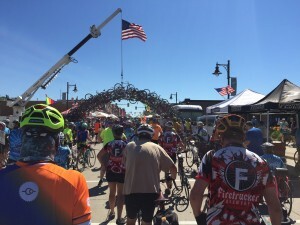 The Des Moines Register’s Annual Great Bicycle Ride Across Iowa (RAGBRAI) began in 1973 when two reporters, who also were avid cyclists, decided to organize a non-competitive event. It has grown to become the world’s longest, largest and oldest bike touring event. It was so much fun being one of 10,000 people who participated in the 45th annual RAGBRAI! 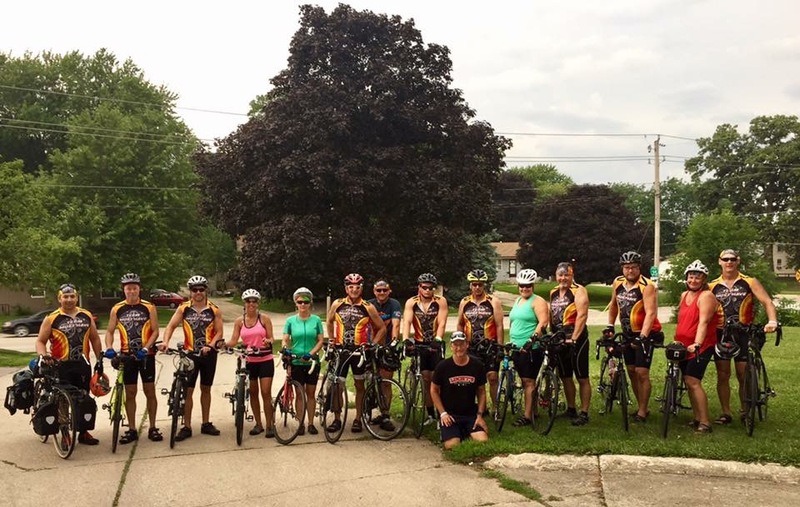 I joined RAGBRAI in Clear Lake where I met up with Team Must Have. The team was started by my uncle and some of his friends and has grown to consist of 30 riders. Most of us rode together last year, so it was fun to be part of their team again this year. Team Must Have before we took off from Clear Lake, IA! When I returned to the office for work after the ride it was quite a different routine than I was used to on RAGBRAI. I was wearing khaki pants and a polo, rather than my biking shorts and jersey. Instead of packing up my tent, I was packing my lunch. I also used my feet to hit the brakes instead of my hands, and experiencing a much faster commute to my end destination. There is, however, one thing these two routines have in common. I couldn’t help but notice how much agriculture touches my life every day regardless of where I am. Most towns RAGBRAI riders passed through had an agricultural booth or display. Because I’ve been involved in this industry my whole life, I truly enjoyed seeing how my two passions of biking and agriculture merged together. In the first town I rode into, Thornton, IA, North Iowa Cooperative had a great Ag Display to greet riders. The display featured tractors, a planter, and sprayer. They were handing out Chapstick to lure people into their display. You are probably thinking, why would Chapstick draw a crowd? Riding your bike all day in the elements of an Iowa summer, your lips get very chapped, therefore Chapstick is a must have. After receiving their complimentary gift, I saw lots of people taking pictures on or next to the farm equipment. In my short-time at the display I also heard many meaningful questions and conversations about conventional agriculture. In addition to ag companies making an effort to showcase agriculture, 4-H clubs and FFA chapters can also be seen throughout the route. Most of the time you will find these groups in the meeting towns conducting a fundraiser for their club or chapter. This leads me to another great thing about the RAGBRAI culture, people show their support for local organizations when buying their lunch, a water to quench their thirst, or an afternoon snack. Personally, in any of the towns I will go out of my way to support the local 4-H & FFA chapters. The Lawler Lassies and Lads even set up farm- related games for riders to play. This included a hay-bale throwing contest, cow-chip throwing contest, and agriculture trivia. Many riders stopped to enjoy the games and view the animals they had on display! Although I enjoy supporting local organizations in my ride across the state I also enjoy eating at the Farm Boys breakfast stand. This stand travels with RAGBRAI riders and is by far one of the best ways to begin your day. In fact this is a routine for my team, almost every morning you will find Team Must Have chowing down on excellent breakfast burritos. The Farm Boys Hearty Food Company is a family, farm-based operation and was started by Iowa Farmers. It also adds to the experience because each day they set up at a new farm along the route. In addition, all their ingredients come from around Iowa! 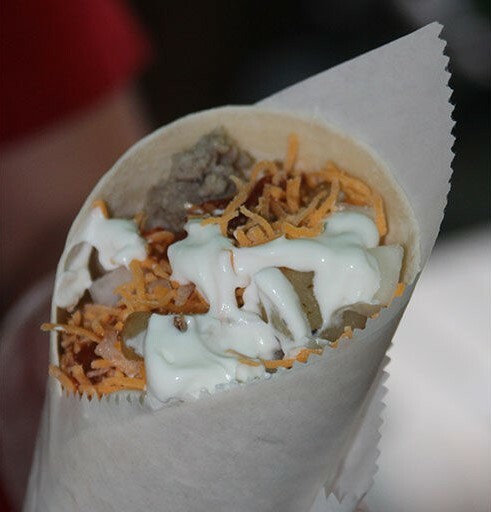 If you want to try one of these tasty burritos you can also catch this stand at the Des Moines Farmers Markets on Saturday Mornings. Another food stand that is an excellent staple of Iowa agriculture is Mr. Porkchop. You can spot this stand from miles away when you see the iconic pink bus with a pig face painted on the front. This stand was started by Paul Bernhard, a pig farmer from Bancroft, IA. This stand features a thick and juicy pork-chop served on a paper towel. While the chops are well known the owner was even more of a RAGBRAI celebrity. He had a signature rally cry of yelling “Pork chooooooop” at the top of his lungs that we would yell to attract riders to stop. Unfortunately, Bernhard passed away this past year and an entire day of the ride was dedicated to him. What a great way to honor an Iowa Pig Farmer that welcomed so many visitors to our great state! The final staple of agriculture on RAGBRAI is simply the Iowa Landscape. Iowa was built to be a farming community. One of the first things that everyone talks about on RAGBRAI is cornfields, cornfields everywhere. In fact, a RAGBRAI t-shirt featured at the merchandise booth the year read “In a corn field, far, far away.” Additionally, you ride past so many farms along the route. These farms really make the “Iowa Nice” culture shine through by handing out free water or snacks. Some even set up a display of their prized tractors or hang up signs to welcome riders and wave from the porch! The great thing about RAGBRAI is how it expands beyond Iowa. Riders come from all of the world to participate. As an agvocate, I am proud to see the story of agriculture being told across the state alongside such a great Iowa tradition! Since I raved about the breakfast burritos earlier I felt it was only appropriate for me to include the Farm Boy’s recipe! Remember to thank an Iowa Farmer after enjoying this delicious breakfast! Stack tortillas and wrap in foil and place in 350° oven for 10 minutes until heated through. In nonstick skillet, melt butter over medium heat. Place potatoes in pan and shake pan until potato cubes are covered in butter. Cook until golden brown on all sides, flipping potatoes as needed. (The less potatoes are stirred, the better. Extra crispy, potato cubes are achieved by flipping in pan versus stirring.) Remove from heat, keep warm. Whisk eggs, milk and salt in bowl. In large skillet, cook eggs until fully scrambled, folding and stirring constantly on medium heat to avoid sticking and browning. Finely chop eggs with spatula. Remove from heat. Divide eggs among the six tortillas, top with potatoes, sausage, bacon crumbles and desired toppings. Fold burrito up from bottom, then wrap sides into middle of burrito, leaving top of burrito open.